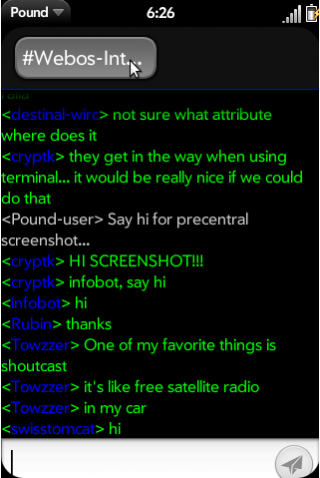 An IRC App. You can connect to several different Internet Relay Chat networks and join multiple Channels. You can currently connect to AfterNET and FreeNode and maybe Quakenet. Some others will be added as working qWebIRC gateways are identified. 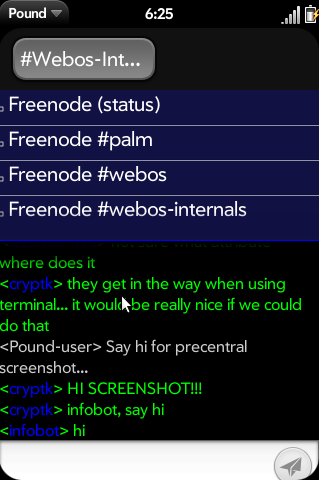 Unlike the other *excellent* IRC app for webOS called wIRC, Pound works WITHOUT any back-end services or 'rooted' requirements. It does this by using http requests to existing qWebIRC installations which some IRC networks maintain. Because of this it may be easier to allow into the official app catalog, and is significantly less risk to install. Pound works well enough to use, but should be considered development version, and definitely has lots of TODO's and issues to be addressed. Please install it only if you understand that it is very much a work in progress still.